If mountain goats were bottled, they'd be a certain Dutch beer, because mountain goats reach the parts other beasts cannot reach. Blessed with climbing skills to impress the most intrepid mountaineer, these agile, sure-footed creatures deserve to be held on a pedestal as lofty as the alpine crags on which they appear. 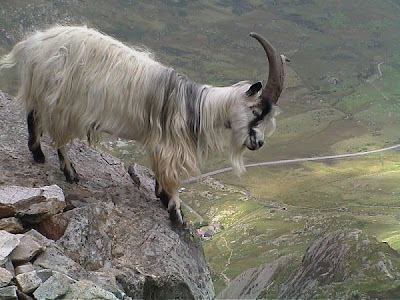 Practically the only negative thing you could say about the mountain goat is that it isn't - a goat that is. 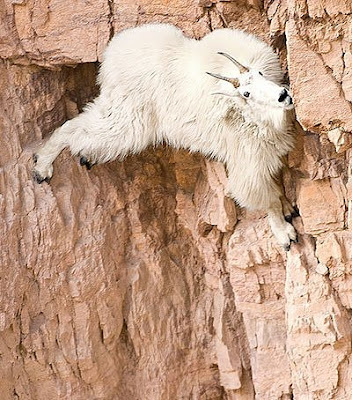 We couldn't leave you without a snapshot of the mountain goat's smaller cousin, the feral goat, which also takes to rugged, mountainous terrain and displays top co-ordination in the most precarious places. Found throughout the globe in spots like the mountains of the British Isles, these living waste disposal machines can become invasive species in habitats not adapted to their vegetation-clearing ways.